Raise Your Hand for Ohio and Licking County 4-H! Some of you may remember over the last two years, that 4-H did a Raise Your Hand campaign where 4-H alumni, members and supporters could “vote” for their state 4-H program. Both years, Ohio has come in 1st which one the state $20,000! They awarded the counties with the most “hands raised” anywhere from $500-$2000 depending on where the county ranked within the state. Thanks to all of you who raised your hands, Licking County has received some of that prize money both years. We’re asking for your help again this year to make it a “three-peat” win! “Raise Your Hand” for 4-H here by May 15th and help Ohio and Licking County 4-H! 4-H clubbers can bring in a photo of their animal (an animal used for a project preferably) dressed up in a costume. They can send or bring the photo into Tractor Supply at 659 W Coshocton St in Johnstown, OH. Customers who purchase clovers (donations) will be able to use their clover to vote on their favorite costume. The member whose picture receives the most votes will win a TSC gift card. Clubs can also select a time to come into the store and sell clovers themselves, or baked goods, etc. during the drive. Members can help customers with their purchases, etc. 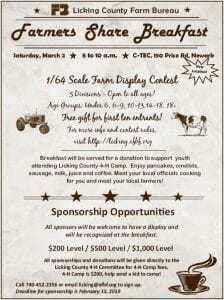 Advisors can contact the Johnstown TSC to set up a time for their club to represent 4-H in the store. Near the end of the clover drive, on April 6th from 10am to 3pm, the Johnstown TSC will have a fashion show of any members who want to participate with their animals, all dressed up! They can come and dress up even if they didn’t send a photo in. There will also be hot dogs they can sell for donations too! Please contact the Johnstown TSC at 740-966-5415 if you are interested in any of these opportunities. Visit your local Tractor Supply this spring and purchase a paper clover to help Licking County 4-H members attend 4-H camps and leadership events. Every year, 4-Her’s in Licking County participate in a number of 4-H programs to help improve their knowledge and leadership skills. This spring, local Tractor Supply stores are continuing their long-standing partnership with 4-H for the 2019 Spring Paper Clover Campaign to make it possible for more youth in the community to experience 4-H’s youth-led, hands-on programming. March 27 through April 7, Tractor Supply customers can participate in the 2019 Spring Paper Clover campaign by purchasing paper clovers for $1 or more at checkout. 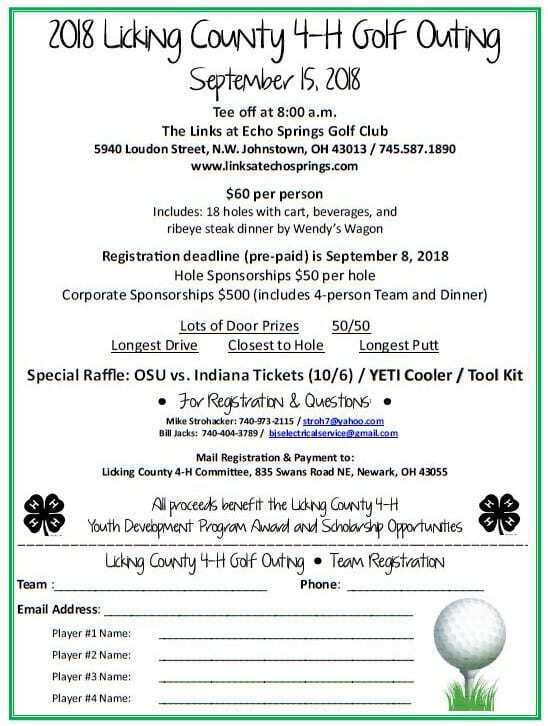 The funds raised will be awarded as scholarships to individual Licking County 4-H members wishing to attend 4-H camps and leadership conferences across the country. The number of scholarships distributed to students following the fall campaign will be determined based on the total amount raised. Since it began in 2010, the partnership between Tractor Supply and 4-H has generated more than $11,000,000 in essential funding. The Paper Clover fundraiser, which takes place in the spring and fall, raised over $60,000 in Ohio during the Fall 2018 campaign. The fundraising effort directly supports numerous 4-H programs throughout the state of Ohio. 4-H and JOANN stores want to see more Licking County 4-H kids learning by doing, creating and making. 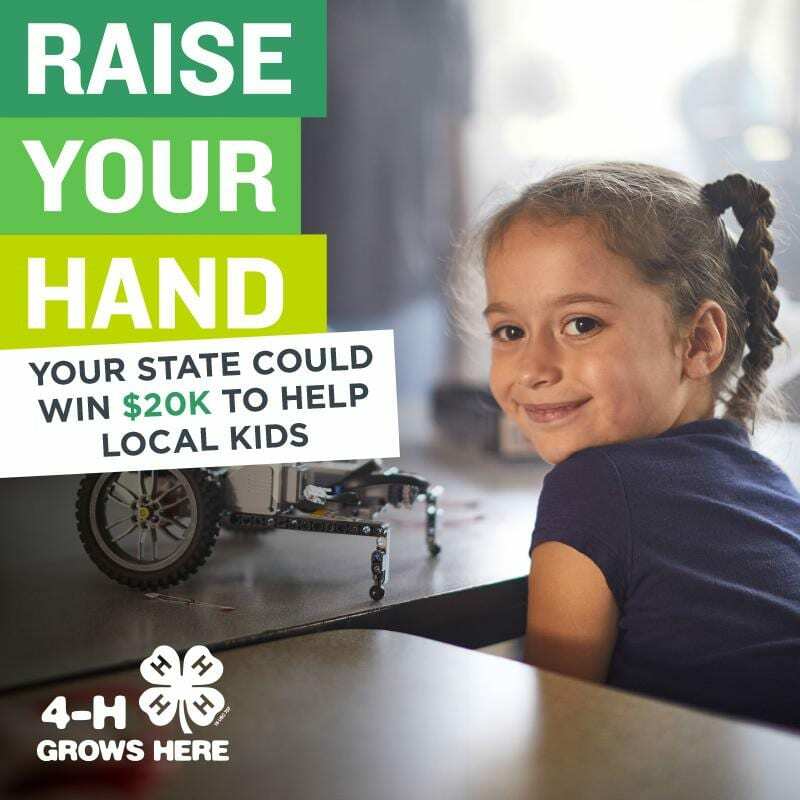 Thousands of local 4-H members, staff, volunteers and supporters will join with JOANN customers to ensure more kids get that chance through a new Clover for Kids campaign to bring hands-on 4-H programs to Licking County. The Clovers for Kids campaign kicks off in 865 JOANN stores nationwide March 1 and will extend through April 30. Supporters will have a chance to show their support by purchasing $1 and $4 Paper Clovers to equip local Clubs with resources to reach more kids in need. Studies show that many students lose their natural love of learning somewhere between kindergarten and their senior year of high school. When more Licking County youth have access to local 4-H programming, they will participate in hands-on projects where they can design, create and make for themselves. These experiences are proven to rekindle a love of learning and produce a variety of benefits – from strengthening their creativity and imaginative thinking to improving their motor skills, coordination and self-esteem. Proceeds from the Paper Clover campaign will directly support Ohio and Licking County 4-H programs. With the $4 Paper Clover, customers will also receive a coupon for $4 off their next purchase. To learn more about the national partnership, visit www.4-h.org/JOANN. 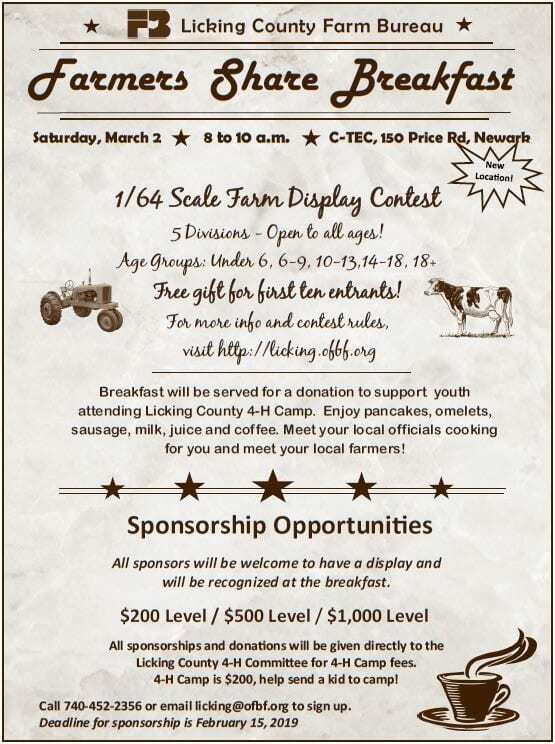 The Licking County Farm Bureau will be hosting their annual Farmers Share Breakfast on Saturday, March 2, 2019 from 8:00-10:00am at C-TEC in Newark. 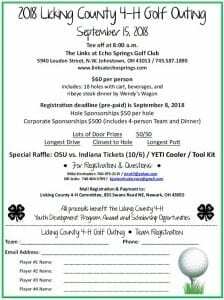 This year, all of the proceeds from the breakfast will be donated to Licking County 4-H to provide scholarships to summer camp participants. There will also be a 1/64 Scale Farm Display Contest that will be open to all ages. Sponsorship opportunities available. Please click here for more information. 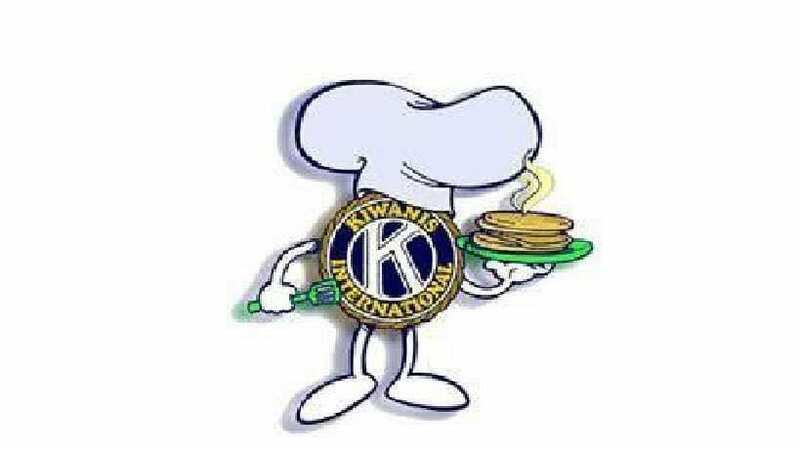 The Granville Kiwanis will be hosting a pancake breakfast on Saturday, February 16, 2019. Come enjoy breakfast or lunch between 9:00a.m. to 2:00p.m. at St. Edwards Catholic Church in Granville. 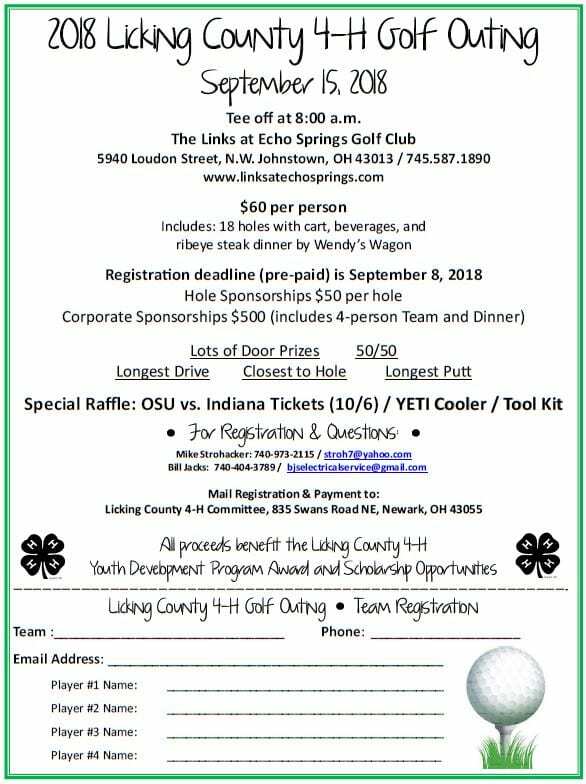 Donations will benefit our Licking County 4-H Summer Camp Scholarship Program! If you are on Facebook, please share the post that is on our Licking County 4-H page to get the word out as far as possible. 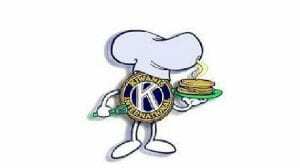 If you know anyone who works with the Granville Kiwanis, please be sure to thank them for the support of our 4-H camping program! It’s time for the Fall TSC 4-H Paper Clover campaign! Visit TSC at Heath, Johnstown or Newark and purchase a paper clover to show your support for 4-H in Licking County. 90% of funds raised come back to Ohio and Licking County to support scholarships for camp and leadership activities. The TSC Paper Clover event runs now through October 14. 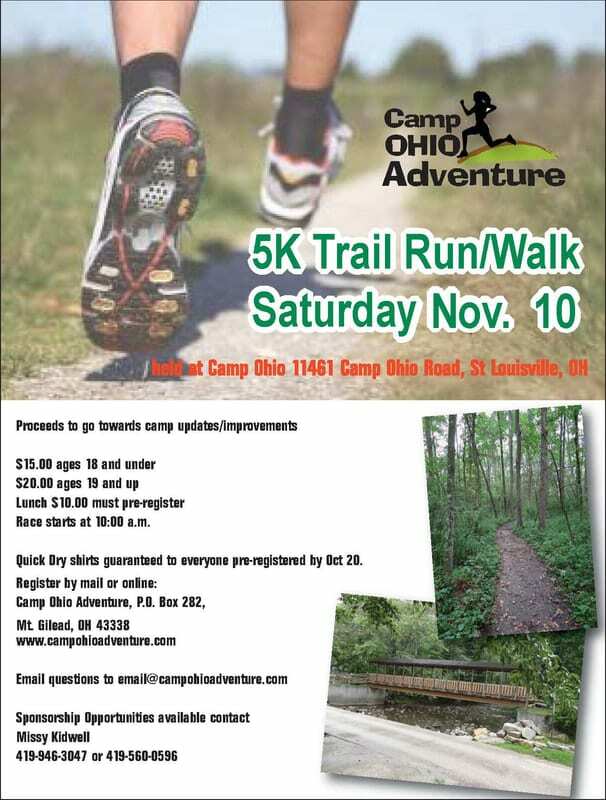 A fun time is to be had by all on November 10, 2018 in the beautiful hills of Camp Ohio 4-H camp in St. Louisville, OH. Wind your way past the wetlands and campfire then along snake trail for a sprint to the top of Vesper’s Hill. Meander past the shooting range and pond where you’ll head back to main camp for the finish. All proceeds this year to go toward camp updates/improvements. After the race we will hold an awards ceremony in the dining hall with an optional lunch immediately following. Registration: Pre-register online or fill out this form and mail it to Camp Ohio Adventure, P.O. Box 282, Mt. Gilead, OH 43338. Race day registration will be available in the Camp Ohio rec hall at 9:00 am. Race Time: Check-in will start at 9:00 am. The race will start at 10:00 am. Awards: Medals will be awarded to the first 3 overall finishers and the top 3 men and women in 6 age categories. T-Shirts: Quick dry t-shirts will be guaranteed to all participants registered by October 20, 2018. Those registered after October 20, 2018 will NOT be guaranteed a t-shirt. 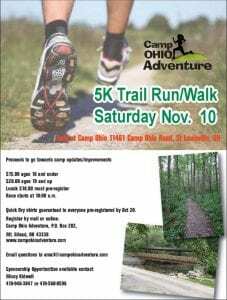 Not interested in running, but still want to support Camp Ohio? Sponsorship opportunities are available.